Steelidjewelry.com have over 100 designs 3D cartoob rubber medical ID bracelets which with moneky, dophline, dragon, butterfly, flower, fruit, cars, star, scoccer ball, airplain design & patterns and … Colors have red, pink, peach, green, purple, blue, yellow, black and … The color can be order as PANTONE color. All the top quality 3D rubber band with 316L stainlesss steel highly polished medical ID tags, the tags also can be brushed as your requirements. The tags/ plates can be engraved/ laser about 4~5 lines text. Durable, waterproof and stylish – meet our 3D cartoon rubber Bracelet Collection. These bracelets are a great choice for active children and teens as well as those on the go. 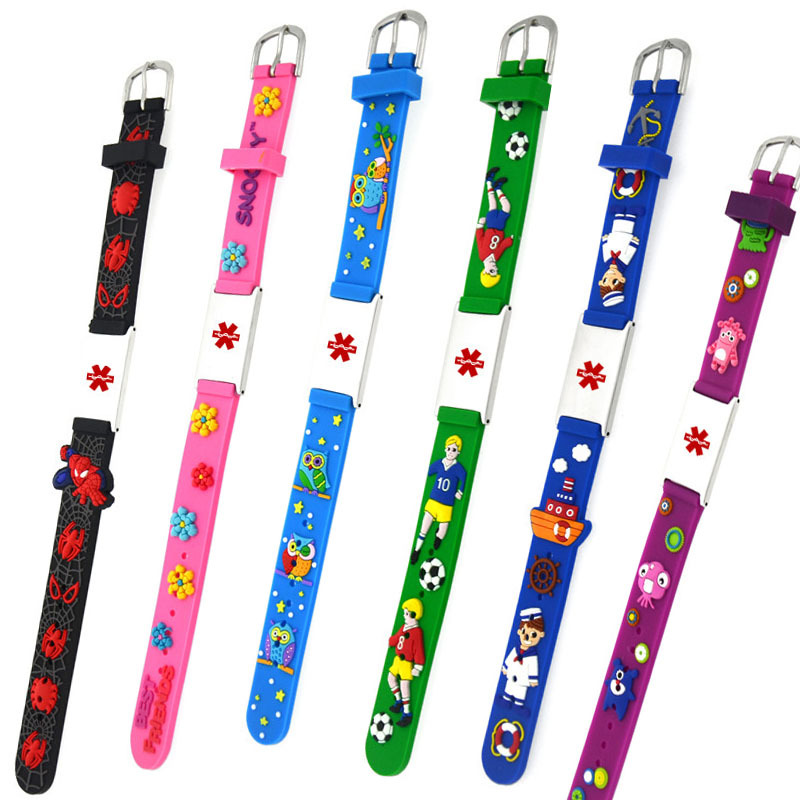 3D cartoon rubber medicaid ID bracelet size can be adjustable, 1 size fits all hands. With a large variety of choices, you can find the perfect medical ID alert that will fit your life style. This entry was posted in New Medical ID Bracelet and tagged 3D cartoon rubber medical ID bracelet, kids autism ID bracelet, kids medical id bracelet, Medical id bracelet, Rubber medical ID bracelet. In need of medical alert Bracelets for men, women, children. Hi Tania Mills, I am Ketty. Thanks for your message. My mail address is trade@tarringjewelry.com, kindly please go to our website choose and check the styles you like, we’ll reply you and quote the price for you asap.